Elegant 1920s colonial in a lovely setting on 4+ acres by the Williams River. 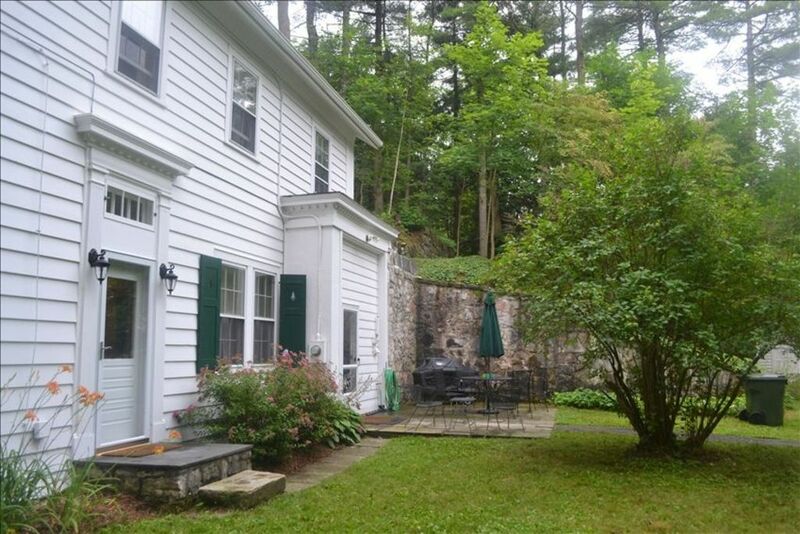 The house is centrally located 2 miles north of Great Barrington center and approximately 20 minutes from Tanglewood, 5 miles to Butternut, 9 miles to Catamount, 32 miles to Jiminy Peak. The house is fully furnished and full of intricate architectural details and beautiful chandeliers and sconce lighting. The space is appropriate for two couples or a family of up to eight people. Downstairs, there is a large living room with fireplace and adjacent music room with a fireplace and a recently reconditioned baby grand piano, a dining room, kitchen, and a full bath with a 55" claw foot tub and hand-held shower. Upstairs, there are four large bedrooms and a full bath. There are two large bedrooms, one with a king size bed, the other with a queen size bed, connected to the common full bathroom with full tub and shower. There are two smaller bedrooms with two twin beds, each connected to one of the larger bedrooms. All bedrooms have AC. Cable TV, DVD, VCR and CD Player/Stereo are located in the living room. Wireless broadband internet is accessible from any room. Enjoy drinks or meals on the patio overlooking the Williams River. Swim in one of the many lakes in the vicinity. Climb up Monument Mountain for an uninterrupted view of the area. Visit the Guthrie Center only a short walk from the house. I am an electrical engineer, and my brother is a retired cardiologist. Over the past decades, we both spent many happy days in this house visiting our parents with our children. My parents bought this house in 1960 as a vacation house. My brother and I now use it for vacation rentals as well as our for our own enjoyment. Tanglewood Music Festival is just 20 minutes north (about 11 miles). For skiing, it's just 2 miles to Butternut, 10 miles to Catamount, 32 miles to Jiminy Peak. For hiking, there are trails everywhere including the Appalachian trail which passes by only 4 miles east of Great Barrington. Swimming and fishing are available at the many nearby lakes. One of our favorite jaunts was the family climb up Monument Mountain at least once during each stay. All beds provided with high-quality linens. The downstairs is where we spent most of our time. The fireplace in the living room area is just delightful and most nights we fell asleep in there only to drag ourselves up there very early in the morning. Great soaking tub and all the amenities you could possibly need. Right near town but far enough away that you feel like you are not bothered by tourists or other people. The owners are an absolute delight and highly responsive to any questions you may have. We had a wonderful time, plenty of space, charming living room where my husband and kids and I played the piano all weekend long, and attended a family wedding at the nearby Guthrie Center. House was very clean, and the hosts left snacks and wine for us which we enjoyed after getting in late and not being able to get out to the grocery store till the next day. We had a great time. The river is lovely. The house is far off the street, but close to activities. The house is comfortable and charming. It's a wonderful place to come back to after being out and about at the many things there are to do in the Berkshires. The house was very well equipped - kitchen well stocked with both basic foodstuff and dishes/equipment for cooking. Relaxing and charming. Our week in this beautiful home was restful and rejuvenating. The Great Barrington location is ideal - we were within comfortable driving distance from the many cultural and natural highlights the area has to offer. The house was clean, well-furnished and comfortable. There was a real sense of (family) history in the home, as well as efficient wifi and other modern technology. It was wonderful to be able to use the piano. The kitchen and bathrooms were well-stocked with anything we'd need, and the facilities (washer/drier/dishwasher) were excellent. We hope to be able to return at some point in the future! Only recommendation: the kitchen knives should be sharpened.